To celebrate International Women’s Day 2018, Barbie manufacturing company, Mattel, unveiled their new ‘Role models’ collection of 17 dolls honouring inspiring women. Committed to celebrating women who have made groundbreaking contributions to their fields, this collection aims to empower young girls and mark a departure from the doll’s previous focus on beauty and fashion. The Role models collection features dolls of historical feminist icons such as Amelia Earhart and Frida Kahlo as well as more contemporary figures like Wonder Woman director Patty Jenkins and Nicola Adams OBE, the first woman to win an Olympic gold medal in boxing. But how much are these dolls really contributing to the women’s movement? It certainly appears that Mattel is trying to create more positive and three-dimensional representations of women. 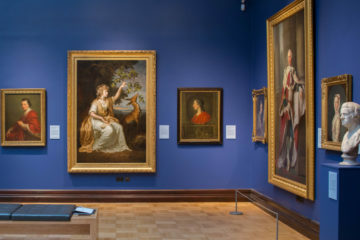 Another, perhaps less publicised, range of dolls is the ‘Barbie Career Dolls’, depicting dolls in a range of professions, many of which are traditionally seen as male-dominated. In 2016, Mattel released a range of tall, petite and curvy dolls that are available in seven skin tones with 24 different hairstyles to choose from. Designed to better reflect their audience’s diversity, as well as appeal to what Mattel identifies as “millennial moms”, this range gives more choice to young girls and hopefully allows them to find dolls that look more like them. Barbie has long been at the centre of feminist debate: is she sexist? What are the impacts of the unrealistic body image she traditionally promotes? By presenting images of successful women, however, Mattel is demonstrating its ability to progress. Others are more cynical. Denounced as “nothing more” than a marketing strategy, Dr Rebecca Hains argues that Mattel is not interested in “promoting girls’ empowerment – just Barbie.” The fact that Mattel’s sales have steadily been decreasing since 2013 only underscores her point. Indeed, some of Mattel’s past stands in contrast to the inclusive ideals their newer ranges promote. In 1997, in pursuit of giving Barbie a makeover and being more reflective of current society, Mattel introduced ‘Share-a-Smile Becky’, Barbie’s friend who uses a wheelchair. The first fashion doll to come in a wheelchair, Becky was an instant hit, with between 4,500 and 6,000 dolls sold across the US within two weeks of hitting the shelves. Disability advocate John Kemp told the Chicago Tribune in 1997 that Becky worked to “dispel stereotypes and show that people with disabilities can be fun, beautiful and playful”. However, it was later discovered that her wheelchair would not fit through the doors of the Barbie Dreamhouse. Instead of changing the house, Mattel discontinued Becky. Karin Hitselberger blogged about the product and drew parallels to the harmful effects the discontinuation of Becky had for the perception of disabilities. She pointed out that Becky did not fit into Barbie’s world but it was “easier to get rid of her” than to redesign her surroundings. This sends a dangerous message: rather than ‘fixing’ society, we need to ‘fix’ people. The newer collections have also received mixed reviews on social media. Many felt the dolls were unrepresentative and ‘Barbiefied’: instead of accurately depicting the real physical appearances of women in their Career Dolls series, they are “horrifyingly-proportioned”. In 2015, The F-Word wrote that while it might be empowering for Barbie to have a new wealth of career options, the unrealistic body image she promotes remains essentially harmful. This was mirrored by Kahlo’s great-niece, whose lawyer said that the doll should “match what the artist really was”. However, the unrealistic body type promoted by Barbie creates its own unachievable image for young girls to aspire to. According to an infographic based on research conducted by Rehabs.com, a Barbie doll’s waist, which is smaller than her head, could only have “room for half a liver and a few inches of intestine”. Her ankles are too small to hold her body weight and she would be forced to walk on all fours. Having grown up in the era dominated by leggy blonde Barbies, witnessing these developments is heartening. 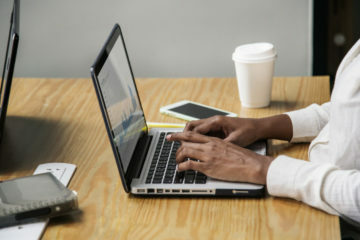 Regardless of whether it is simply a marketing strategy, Barbie is endorsing positive role models and promoting careers beyond those traditionally associated with women and femininity. There are also a range of other companies that are producing body-positive and empowering dolls for young girls. For example, Australian mother Sonia Singh’s ‘Tree Change Dolls’ have become an internet sensation. Singh repurposes old Bratz dolls by removing their makeup, repainting their faces and sewing on clothes that are more realistic for the dolls’ supposed ages, presenting a more authentic image for young girls. ‘Lammily’ is another doll that presents a more realistic body image, with accurate bodily proportions and including stretch marks, scars, freckles, acne and casual clothes. These projects reflect the hard work of many individuals to present a healthy and positive image of women to today’s youth. Featured image courtesy of Mattel. 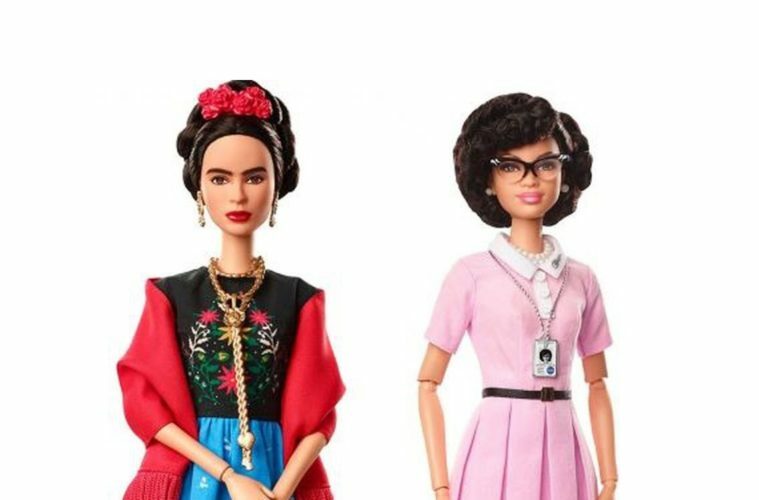 It shows two of the dolls in Barbie’s latest ‘Role Models’ collection: one depicting Frida Kahlo and the other Katherine Johnson. 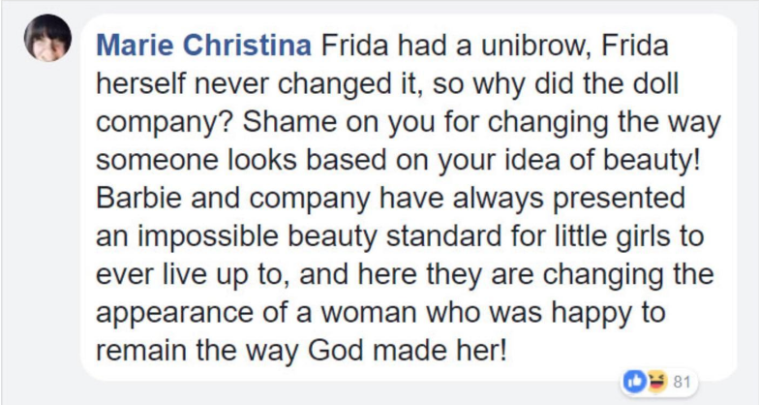 The text of the Facebook post reads: Frida had a unibrow, Frida herself never changed it, so why did the doll company? Shame on you for changing the say someone looks based on your idea of beauty! Barbie and company have always presented an impossible beauty standard for little girls to ever live up to, and here they are changing the appearance of a woman who was happy to remain the way God made her! Fundamentally, Mattel is making money out of female icons, without being too concerned about accuracy of form. Hence, Kahlo loses her unibrow and I suspect that her disabilities were erased too, such as her amputated leg. I haven’t personally seen one of these dolls but I am prepared to be advised if I am incorrect, in this regard. Kahlo was a Communist politically, therfore in her personal view of a company selling doll images of herself for profit, she may well have disapproved of their business approach ie making money in such a manner.